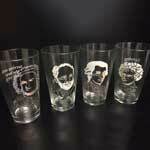 Enjoy your favorite beverage in WDAV’s 40th Anniversary pint glass collection. This set of 4 features Beethoven, Bach, Mozart and Tchaikovsky with the WDAV logo. Each glass holds 16 ounces.